exchange for an honest and unbiased review I said yes. I was excited to get to try out a new beauty product. Everyone needs a cleanser so I was interested to learn about the Oz Natural ocean mineral facial cleanser and see what makes it special. The first thing I noticed is it’s made of natural and organic ingredients. And does not contain alcohol, parabens or sulfates and is safe for all skin types. My skin can be sensitive at times so I was liking what I was reading. Another thing that caught my eye was this is made in the USA. I try to buy products that are made here in the USA. With all the outsourcing of work I have seen going on with large corporations it is nice to see a company product products here and not follow the growing trend of outsourcing. The Oz Naturals cleanser is a clear liquid that can build up a light lather when mixed with water. If you are someone who really likes a lot of lather you won’t like this cleanser. The later is very light and the bubbles loose. I did not really seem to notice a fragrance or scent. It gently cleansed my skin. I did not feel like my skin had been striped or any tightness when I was done using the cleanser. Overall I really liked this cleanser. It was a nice light, foaming cleanser that cleaned my skin of any dirt and oil without stripping or drying out my skin. 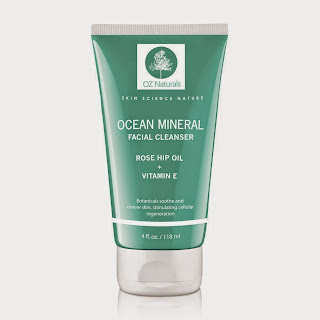 I received the Oz Naturals Ocean Mineral Facial Cleanser complimentary for evaluation purposes. Regardless, all opinions expressed are still 100% my own. I am disclosing this in accordance with Federal Trade Commission 16 CFR, Part 255 Guides Concerning the Use of Endorsement and Testimonials in Advertising.